The worth of an archives is not merely to be found in the records that it stores—nor in its journals, missionary letters, rare books, sepia photographs, films, or audio files. An archives finds its value in sharing those resources in useful and relevant ways with each new generation, so that an awareness of who we have been in the past shadows and shapes our knowledge of who we are today. As the year winds to an end, I wanted to share my gratitude for the many ways I have personally been touched by these efforts to extend the reach and reality of Presbyterian history in 2017. As part of our year-long focus on “Celebrating, Remembering & Sharing” Presbyterian history, we commemorated important 2017 anniversaries in the life of our faith. I am grateful for the many churches that worked with PHS to prepare anniversary materials for their congregations, and for the congregations around the country that invited me to speak about the Reformation’s 500th anniversary or other significant Presbyterian commemorations, such as the church’s response to Executive Order 9066 75 years ago. Those invitations encouraged me to brush off my seminary history books and read excellent new monographs about key church leaders. As I prepared to teach workshops at the Big Tent conference in St. Louis and week-long courses at the Synod of Lakes and Prairies Synod School and the Asian Leadership Study Program at Columbia Theological Seminary, I found our own archives a rich resource of primary sources, online exhibits (including American Revolution and Reformation exhibits), and blog posts from which to draw. My interactions with everyone who attended 2017 workshops, congregational classes, or courses have been rich. I am especially grateful to each of you who engaged me after class with questions and thoughts. You enriched my own growth as a historian and, through your questions and ideas, my understanding of how our national denominational archives can better serve you. I am so appreciative, too, for my PHS colleagues who traveled in this past year to present at conferences, presbytery meetings, and other events, or who skillfully hosted tours and group meetings at our building. 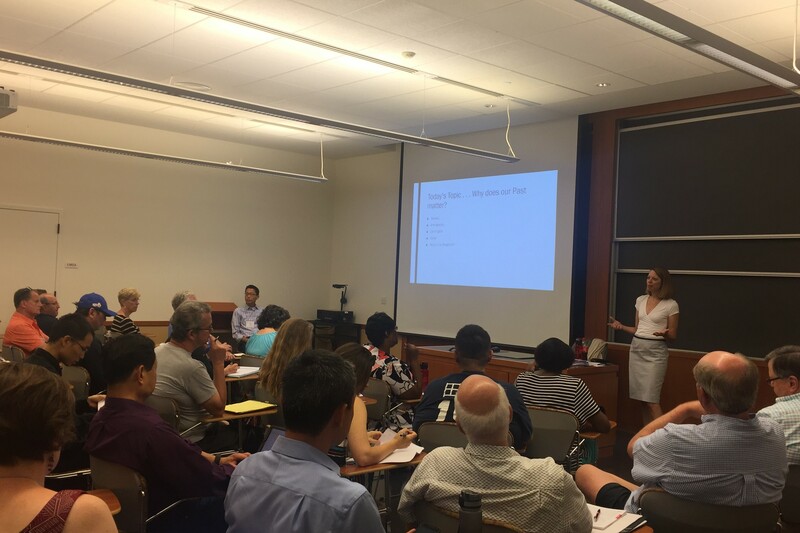 Our Board Directors also make a deep commitment when they agree to serve, doing outreach of their own as ambassadors for PHS, and making special financial commitments to support the work we do. 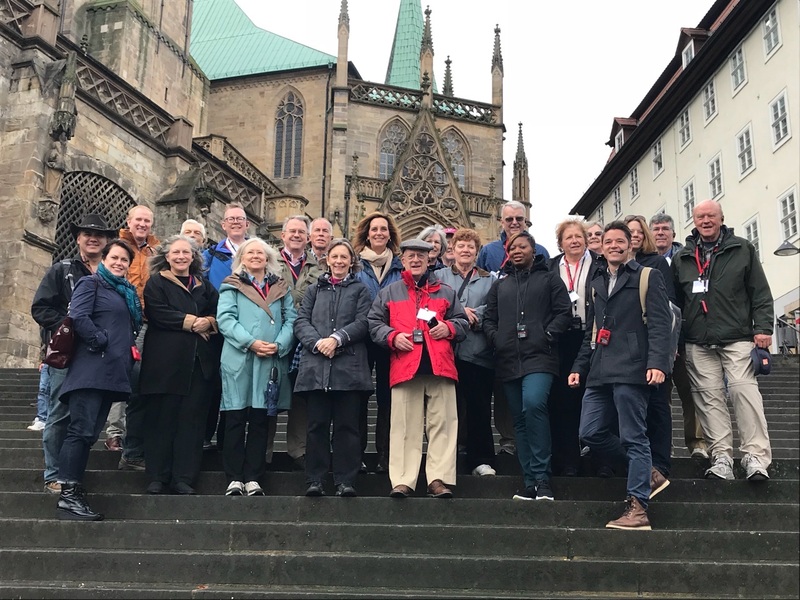 PHS’s longest 2017 journey occurred in October, when we joined with the Presbyterian Foundation on a ten-day Reformation 500 Study Tour that followed the steps of Reformation leaders Martin Luther and John Calvin around Europe. Twenty-three people joined us on the trip, which was a rich experience of sight-seeing, in-depth study of Reformation documents and the Bible, meeting with leaders of the Reformed churches in Germany and Switzerland, and connecting the Reformation goals and values with the current state of our own Church. We formed new friendships while deepening our knowledge that God is the instigator and guide of all reformation—then and now. In this year of remembrance, we are called to renewed joy and thanksgiving for our Creator, Savior, and Sustainer. I am thankful to our friends at the Presbyterian Foundation for sharing this trip with PHS and for everyone who made it such a success. My hope is for PHS to lead a “Reformation Part II: Scotland and Iona” trip in 2019 and to create domestic travel opportunities that deeply engage in the richness of American Presbyterian history. Please let me know if this interests you! Throughout 2017, PHS collaborated with the Presbytery of Philadelphia to celebrate its 300th anniversary. Our work with members of the presbytery on a mural project, collecting church histories on our website, and sharing the original minutes from the presbytery's first meeting as the Presbytery of Philadelphia in 1717 strengthened our relationship with the presbytery, just as the record-breaking number of church tour groups that visited our building in 2017 grew awareness of PHS among congregations in the mid-Atlantic region. We are grateful for opportunities to work closely with each of the PC(USA)’s 16 synods, 171 presbyteries, and 9,450 congregations. In the spring we renovated our building front, completing the Stated Clerk Square that was created together with the Committee on the Office of the General Assembly to honor our previous Clerk, the Reverend Gradye Parsons, and to provide a serene and welcoming landscape befitting the venerable Calder statues; in September, close to the 50th birthday of our building, a Museum Without Walls interactive sign was also installed. 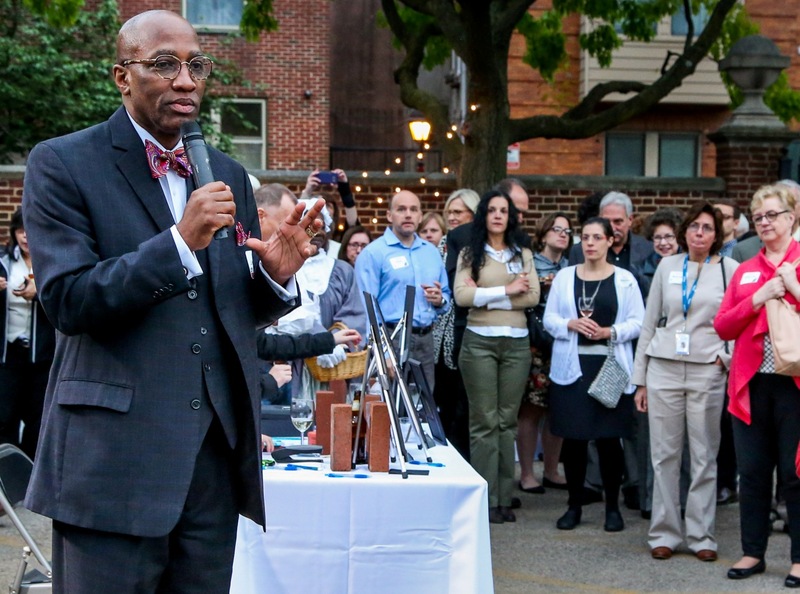 Another highlight of the year came in May, when staff and volunteers worked overtime to host our first ever outdoor fundraising event, Taste of History. The energy and joy evident in that successful party raised all of our spirits, as did the wonderful words of our Stated Clerk, the Reverend Dr. J. Herbert Nelson, II. I am so grateful to everyone who made the celebration possible, reminding us that PHS is an exciting place of opportunity in new and continuing ways. Our digital archives, Pearl, grew by 4,500 new images, documents, and multimedia items, even as our staff worked to digitize records on request from congregations, presbyteries, and individuals. PHS staff could not do this work without the generous partnership of the Board of Pensions, a PC(USA) agency that provides the server space and technical support necessary to maintain our digitized materials. I am grateful to our friends at the BOP for all they do for us in the digital realm, just as I am grateful for PHS staff who added 650 new cubic feet of paper records to our state-of-the-art archives annex in 2017. Each year hundreds of academics, genealogists, and congregational historians come to PHS from all over the United States and across the globe to use our collections. It has been a pleasure to converse with many of you and to learn about the work you are doing in areas such as the Social Gospel movement, women’s roles in the modernist-fundamentalist debate, missionary activity in Latin American agriculture, and schools and hospitals founded by Presbyterian missionaries in Korea and Japan. 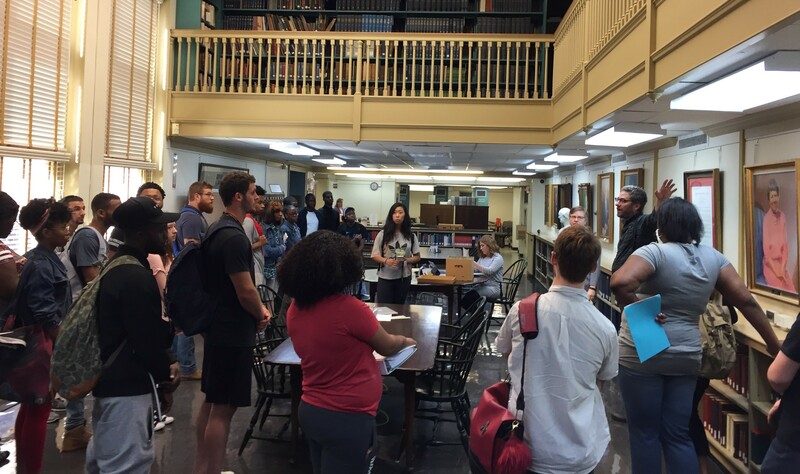 An exciting new partnership with teachers and students at the Community College of Philadelphia is allowing PHS to serve students from CCP’s History, African American Studies, and Religion departments. In 2017 PHS began hosting CCP students in our reading room, with staff members working one-on-one to bolster students' primary source research and critical thinking skills. I felt so blessed one afternoon to be able to engage with a young man working on a paper about 19th century Presbyterian attitudes toward slavery; it was exciting to work with someone who had never conducted research at an archives, and to see him examining 200-year-old documents. As PHS expands our work with CCP and other student groups in the coming years, our staff is encouraged by such opportunities to serve new audiences in new ways. Lastly, I am extremely thankful for each of you—our readers, followers on social media, and financial supporters. Congregations and presbyteries that participate in the PC(USA) per capita program provide funding for 63% of our budget; membership and annual gifts from churches, mid councils, and individual supporters help us make up the difference. You—all of you—help us continue a unique historical ministry that has served Presbyterians and general researchers since 1852, and that will continue to innovate with each new year. Thank you for sharing in every way that you do. It is such a pleasure and honor to serve you. 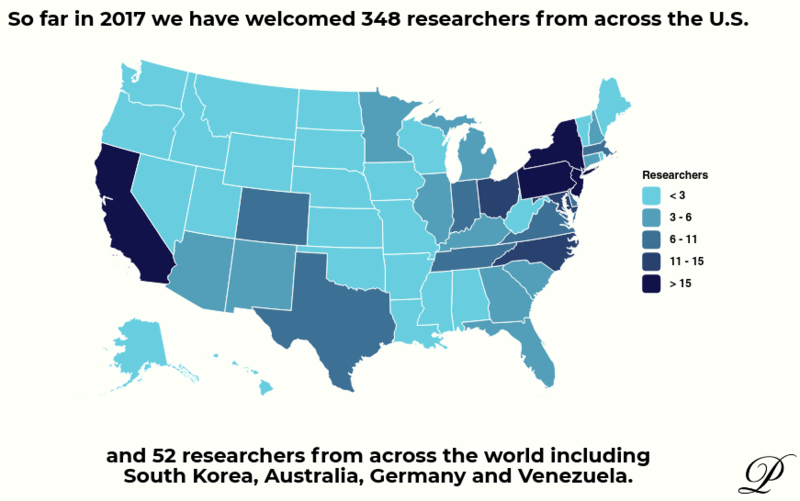 Learn about our research and travel grant program.